The TVS group has chosen a steady approach to growth, staying on the road it knows best. In the early 1930s, selling cars to rich zamindars in southern Tamil Nadu was not easy. They preferred horse-drawn carts. T.V. Sundaram Iyengar & Sons, or TVS & Sons, which had bagged a General Motors dealership, decided to drive its message home quite literally. A Chevrolet car, complete with chauffeur, would be sent to a zamindar's house, with a request that he use the car for a week. Over the next seven days, the family would often get used to the comfort and status the car gave them, and end up buying one. The company also invited the local elite to arrive in their horse-drawn carts and drive out in a car. Such precursors of the exchange offer and the test drive were not the only things TVS & Sons pioneered. After the car was sold, the dealership kept a record of its performance, periodically interacted with old customers and ensured complaints were addressed in 24 hours. In the 1940s, it even launched a mobile service facility to go to the customer's doorstep. TVS, established in Madurai in 1911, did not cater only to the rich. Indeed, its first business, started in 1912, was a rural transport service. TVS went the extra mile to ensure buses ran on time. One measure to minimise delays was to fit a special vehicle with heavy-duty magnets underneath. The magnets would pick up nails and bits of horseshoe, left behind by horses and bullocks along the route, and reduce the risk of delays due to punctures. A century later, customer satisfaction and employee welfare continue to be the cornerstone of the group, which is now run by T.V.S. Iyengar's great-grandsons. TVS & Sons is the holding company of the group, and still runs the group's dealership and spare parts distribution businesses. Each generation of the family has left its mark on the group, which is now a $4-billion (Rs 17,936 crore) conglomerate that makes two- and threewheelers and car parts, and has a strong presence in logistics and financial services. Founder T.V.S. Iyengar, a lawyer, gave up two comfortable jobs - in Indian Railways and at a bank - to pursue his entrepreneurial passion. He laid the foundation of the company both in terms of the business and the values that guide the group. The group, which until 1960 was engaged in services - rural transport, car dealership, auto parts distribution, vehicle insurance, and auto finance - ventured into manufacturing with the second generation, consisting of T.S. Rajam, T.S. Krishna, T.S. Srinivasan and T.S. Santhanam. "We began talking to joint venture partners in 1959 to make auto components," says H. Lakshmanan, Executive Director of Sundaram Clayton, who has been with the group for 58 years (having joined in 1953 at age 20). "Wheels India was set up in 1960, followed by Sundaram Clayton, Brakes India and Lucas TVS." The third generation focused on quality management. 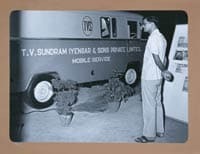 The first three Indian companies to win the prestigious Deming prize, awarded by the Union of Japanese Scientists and Engineers, were from the TVS group. "Total quality management reinforced TVS values of trust, loyalty and quality, and employees could relate to it easily," says Venu Srinivasan, chairman and managing director of TVS Motor. He and his cousins also made their business global. TVS Motor set up a factory in Indonesia, Sundram Fasteners started one in China, and they bought companies in Germany and the UK. The fourth generation, which is taking over now, will be tested on its ability to consolidate and to fuel growth. The group has sometimes been called conservative, for sticking to the automotive space and passing up opportunities elsewhere. "We are not after money," says Suresh Krishna, Chairman and Managing Director of Sundram Fasteners. "Our dharma is to... add value to the nation and to the stakeholders in it." Perhaps it is this approach that has kept the group free from controversy.